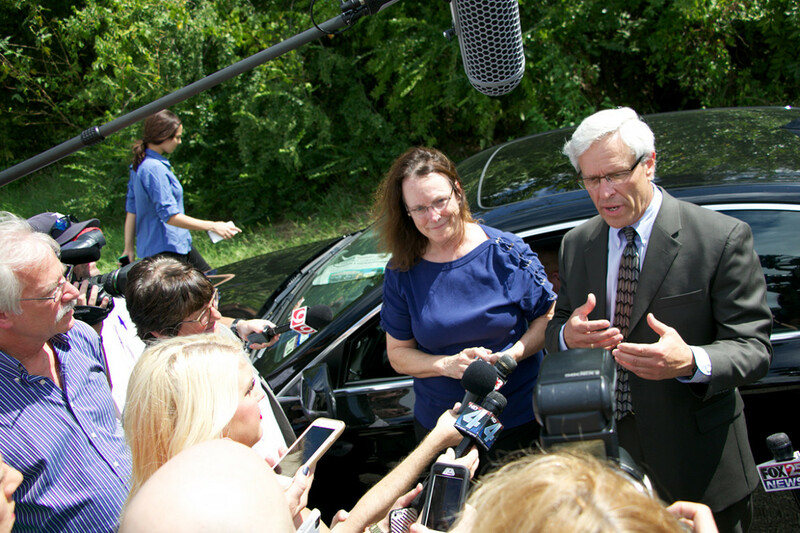 Kathleen Lord and Don Knight, attorneys for Richard Glossip, speak to the news media Wednesday. MCALESTER – Oklahoma was three hours away from executing Richard Glossip Wednesday when the court system threw two major wrenches into the state’s execution process: An appellate court will review new evidence in Glossip’s case, and the state’s controversial drug of choice faces a new federal challenge. Glossip had been served what was supposed to be his final meal when the Oklahoma Court of Criminal Appeals issued a two-week stay to examine claims of new evidence presented by his attorneys in a last-minute court filing Tuesday. Glossip’s attorneys asked for the stay based on what they say is new evidence indicating Glossip’s accomplice, Justin Sneed, may have lied about their client’s role in the 1997 murder of Barry Van Treese to avoid a death sentence. 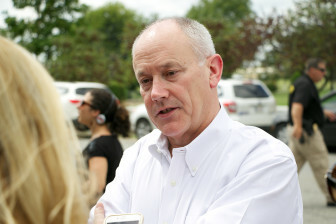 However, in an exclusive interview with The Frontier, Sneed maintains he told the truth at trial about Glossip planning Van Treese’s murder for money. Gov. Mary Fallin, who had rebuffed calls by Glossip’s supporters for a 60-day stay, issued a written statement. 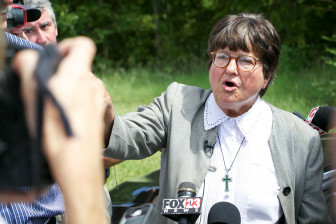 Sister Helen Prejean, the nun and anti-death penalty activist who has been an outspoken advocate for Glossip, was jubilant as she addressed a throng of reporters outside the Oklahoma State Penitentiary, where death row is located. Public opinion, including an appearance on the Dr. Phil show, made a difference in the case, she said. Meanwhile, federal public defenders continued to pursue an injunction seeking to block the state’s plans to use the sedative midazolam to execute Glossip and two other inmates set to die next month. In a filing Wednesday, Glossip’s attorneys asked a federal judge for a preliminary injunction staying the execution due to new information about the availability of lethal drugs. The motion stated they had identified pharmacies that can supply compounded pentobarbital. That anesthetic has proven far more reliable than midazolam, which was used in several prolonged executions throughout the U.S. in 2014. However, as drug manufacturers refused to supply pentobarbital for executions, supplies ran short. Oklahoma and several other states turned to midazolam seeking an alternative. “The defendants have placed Glossip in an unbreakable box that prevents the Constitution from reaching him,” the request for a preliminary injunction states. Oklahoma Corrections Director Robert Patton tells the media of Richard Glossip’s stay of execution. The motion was filed as part of a challenge to Oklahoma’s death penalty process brought by Glossip and other death row inmates. That case was eventually decided by the U.S. Supreme Court, which rejected the challenge by a 5-4 vote. “First, defendants claimed that they looked for compounded pentobarbital, but they refused to explain to Glossip why they were unable to get that drug. Consequently, Glossip conducted his own investigation and discovered that compounded pentobarbital is available in Oklahoma,” the motion said. 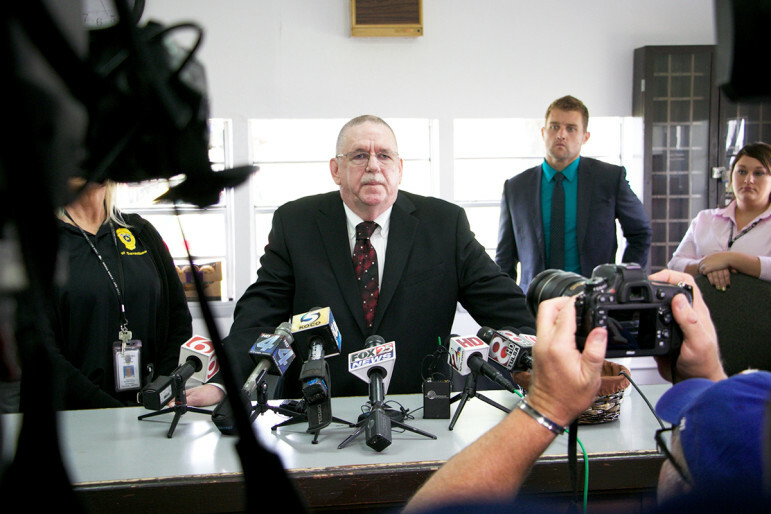 Attorneys told state officials the names and locations of the four Oklahoma pharmacies they had identified as suppliers of pentobarbital, said Dale Baich, a federal public defender who represents the death row inmates. Dale Baich, a federal public defender in Glossip v. Gross. The filing was accompanied by an affidavits from by two paralegals who said they talked to representatives of the pharmacies on Sept. 3. “In the course of calling the pharmacies on my half of the list, I contacted an Oklahoma compounding pharmacy that indicated that it is able to compound sterile injectables and that it is willing and able to compound pentobarbital as a sterile injectable,” one of the affidavits states. Two other pharmacies agreed they could supply compounded pentobarbital, the affidavits state. However, it is unclear from the documents whether any of the pharmacies said they would supply the drugs for executions. Baich said the Oklahoma Department of Corrections informed defense attorneys about 10:30 a.m. Wednesday that it planned to go forward with Glossip’s execution using midazolam. He said he is unsure what, if anything, state officials did to follow up on the new information. “You have to wonder how hard the state tried,” said Baich, standing outside the prison where Glossip was to be executed. Records detail a last-minute flurry of letters and emails between the state and attorneys representing Glossip and two other death row inmates set for execution next month. Assistant Attorney General Jeb Joseph sent a letter, which arrived about 2:30 p.m. Tuesday, to one of Glossip’s defense attorneys seeking additional information about the pharmacies. Oklahoma pharmacies by five o’clock today so that steps may be taken to possibly secure the drug in question in time for upcoming executions,” his letter to Assistant Federal Public Defender Patti Palmer Ghezzi states. In a reply, Ghezzi challenged the state to turn over proof it was following up on the new information. Her letter apparently listed the pharmacies, but that information was redacted from court filings due to Oklahoma’s law prohibiting release of such information. “We ask that you provide us the detail of efforts you have made to locate sources for pentobarbital for the executions of Mr. Glossip, Mr. Cole and Mr. Grant,” her letter to Joseph states. Aaron Cooper, a spokesman for Attorney General Scott Pruitt, said the federal court has ordered Oklahoma’s response to be filed Sept. 23. There is also a hearing scheduled Sept. 25 in U.S. District Court for the Western District. Cooper said DOC should answer any questions about the lethal injection protocol. However, DOC has repeatedly refused to address questions about its drug supplies, citing the pending litigation. The motion filed on behalf of Oklahoma death row inmates states defense attorneys “gave this information to defendants … in response to defendants’ assertion that they wanted to follow up on Glossip’s information. A key issue in the U.S. Supreme Court case that bore Glossip’s name, Glossip v. Gross, involved whether the state has access to pentobarbital, an anesthetic that has proven reliable in past executions, or other viable alternative drugs. The state has claimed it could not obtain pentobarbital and thus turned to midazolam, a sedative that defense attorneys say is unconstitutional. The drug was used in botched executions in Ohio, Oklahoma and Arizona, in which the inmates gasped for air or writhed long after they were expected to be unconscious. In a case that originated in Oklahoma, a divided Supreme Court upheld the use of midazolam in lethal injections in June. Because pentobarbital and sodium thiopental, another drug previously used by the state, were not available, the state had no other alternative to midazolam, the majority opinion states. News of Glossip’s stay came after he had been served a last meal of chicken fried steak, a Wendy’s Baconnator burger and fried fish with a strawberry milk shake. Glossip’s attorneys said a prison official told them about the stay while they were visiting Glossip around noon. Ziva Branstter, Cary Aspinwall and Dylan Goforth are journalists from The Frontier, a Tulsa-based online publication.